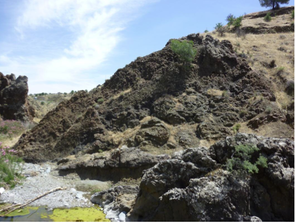 Supra-subduction zone ophiolites such as the Troodos Ophiolite of Cyprus can give important information on the internal structure of the oceanic crust, and the processes by which it is formed. However, the origin of SSZ ophiolites is debated; they may form in a fore-arc location during subduction initiation; at a back-arc spreading centre immediately behind an active arc; at a plate ‚edge‘; or as a result of ridge subduction. Chemical analysis of ophiolite lavas, which could tell us how ophiolites were formed, is complicated by the extensive hydrothermal and seafloor alteration. Using microanalytical methods (electron microprobe, laser-ablation ICP-MS) at the GeoZentrum Nordbayern, we are able to obtain a complete major and trace element analysis of sub-mm sized chips of fresh volcanic glass from pillow lavas. We used these methods to examine the chemical stratigraphy of the Troodos Ophiolite in the Akaki Canyon section on the northern margin of the ophiolite. Akaki lavas have a wide range in trace element compositions – some have compositions similar to modern-day back-arc lavas, others extend towards the field of Troodos boninites, which were derived from a highly depleted, fluid-enriched mantle source that had subsequently been re-enriched by small degree melts. Based on these results we suggest that the Troodos crust was formed at a RTT or RTF triple junction, at a back-arc spreading centre that propagated into arc crust. Regelous, M., Haase, K.M., Freund, S., Keith, M., Weinzierl, C.G., Beier, C., Brandl, P.A., Endres, T., Schmidt, H. Formation of the Troodos Ophiolite at a triple junction: evidence from trace elements in volcanic glass. Chemical Geology 386 (2014) 66-79. Formation of the oceanic crust at mid-ocean ridge spreading centres and its subsequent evolution has an important influence on sea-level, the carbon cycle and seawater chemistry over timescales of 10-100 My. 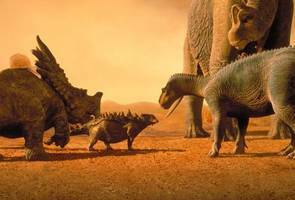 It has been suggested that changes in mantle temperature and/or ridge spreading rate over the Mesozoic-Cenozoic were at least partly responsible for the changes in global climate and eustatic sealevel over this period. Oceanic crust covers approximately 60% of the Earth’s surface and preserves a record of mantle melting processes at mid-ocean ridges, and possible changes in mantle temperature and composition since the Middle Jurassic. Oceanic crust older than about 20 Ma is generally covered by sediment and only accessible by drilling, but although many DSDP-ODP-IODP drillsites have penetrated more than 100 m into oceanic basement up to 170 Ma in age, there has been no systematic geochemical study of these samples using modern analytical techniques. 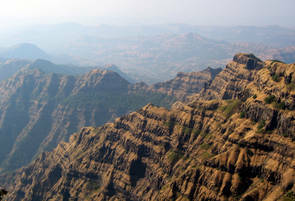 Previous geochemical studies of ancient MORB reported an apparent difference between fractionation-corrected Fe and Na contents of Cretaceous MORB and young lavas from active spreading centres, and this difference was interpreted as the result of a 50-60°C higher upper mantle temperature in the Jurassic-Cretaceous. The origin of this temperature difference is unclear. 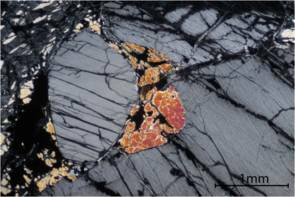 Most existing analyses of ancient oceanic crust were carried out on whole-rock samples, which are variably chemically altered as a result of interaction with seawater. 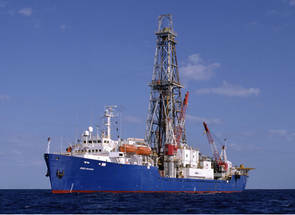 We are therefore carrying out a systematic study of the chemistry of ancient oceanic crust from DSDP-ODP sites in each of the major ocean basins, using microanalytical techniques (electron probe, LA-ICPMS) and fresh volcanic glasses to avoid the effects of alteration. 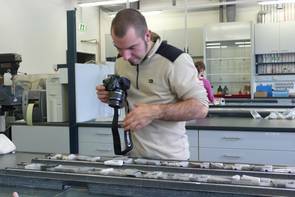 Philipp Brandl has now analysed more than 350 samples from 32 drillsites in the Atlantic and Pacific which range in age up to 175 Ma. 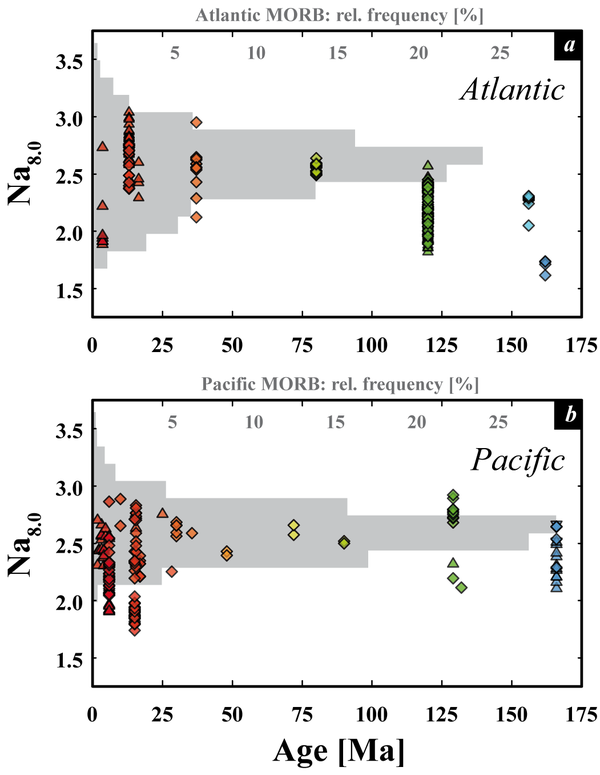 The new data show that there have been apparent temporal changes in the composition of fractionation-corrected MORB erupted in the Atlantic and Indian Oceans, but not in the Pacific. High Fe8 and low Na8 in the oldest Atlantic and Indian MORB could be explained by mantle temperatures 100-150°C higher than the present-day average. We suggest that the apparent cooling of the mantle in these locations over the past 175 Ma is the result of removing the insulating effect of the continental lithosphere following continental breakup. The ‚continental insulation‘ effect is predicted to result in mantle warming of several tens of degrees. Our data represent the first direct petrological evidence for continental insulation, and show that the average temperature of the upper mantle evolves for several tens of My after continental rifting and development of new spreading centres. This effect has implications for past seawater composition, volcanic CO2 output, and sealevel, which must be taken into account in models which attempt to reconstruct these parameters through geological time. Brandl, P.A., Regelous, M., Beier, C., Haase,K.M. High mantle temperatures following rifting caused by continental insulation. Nature Geoscience 6 (2013) doi: 10.1038/ngeo1758. Abyssal peridotites represent the complex melting residues of partial melting beneath mid-ocean ridge spreading centres, and potentially can yield complementary information on the melting process to that obtained from geochemical studies of mid-ocean ridge basalts (MORB). Whereas crystal fractionation Na concentrations (Na90) in MORB can be used to estimate the mean, or bulk degree of melting (FB), the Cr content in spinel (Cr#) from abyssal peridotites can be used to calculate the maximum degree of melting (FM). 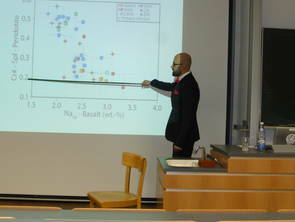 Christoph Weinzierl has carried out a detailed mineralogical and geochemical study of abyssal peridotites from spreading centres in the Indian, Atlantic, Pacific and Arctic Oceans, and combined these new data with literature data obtained from the PETDB online database. Abyssal peridotite samples showing the geochemical effects of extensive alteration or melt refertilisation were removed from the dataset. Our new database includes major and trace element data for both whole-rocks and minerals from over 2200 samples. Systematic variations between spinel, clinopyroxene, orthopyroxene, and bulk-rock compositions show that the samples preserve useful information on melting processes. Peridotite compositions were averaged over single spreading ridge segments, in order to be comparable with the global mid-ocean ridge basalt database of Gale et al. (2013). 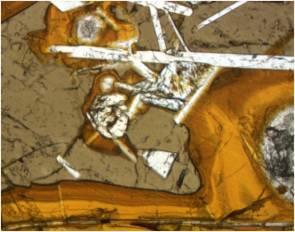 We show for the first time, that abyssal peridotite and MORB compositions are correlated on a global scale. Ridge segments exposing peridotites having undergone higher extents of melt extraction (high Cr# in spinel) erupt MORB representing large degrees of melting (low Na90). Moreover, for ridge segments distant from hotspots, there is a clear dependence of ridge depth, peridotite composition and MORB composition with spreading rate. 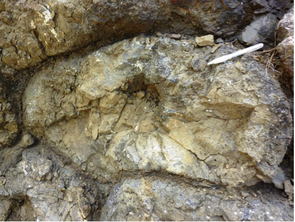 Very slow-spreading ridges are deeper, expose peridotite with low Cr#, and erupt MORB with high Na90. We used a fractional melting model to calculate FM and FB for each ridge segment from Cr# and Na90 respectively. For perfect passive decompression melting the ration FM/FB will have a value of 2 (independent of mantle temperature), whereas for dynamic upwelling and decompression the FM/FB ratio is 1. The effects of thick lithosphere and incomplete melt extraction will yield intermediate values of FM/FB. Our calculated values of FM/FB vary from 0.78 to 2.94, with segments from very slow-spreading ridges having the lowest FM/FB ratios. This large range in FM/FB can best be explained by melting of heterogeneous mantle beneath thicker lithosphere together with incomplete melt extraction beneath very slow-spreading ridges. This relationship between the maximum and bulk degrees of melting, reflected in the compositions of complementary melts and residues produced during decompression melting beneath spreading ridges provides a novel means to evaluate the role of decompression melting in other tectonic environments, for example at subduction zones. New high-precision (double-spike) Pb isotope analyses of lavas from the northern islands of the Tonga-Kermadec Arc have been used to examine the source of the Pb in these samples, and the relative timing of Pb addition from the subducting oceanic crust and subducting sediment. Lavas from the northern Tonga islands of Tafahi and Niuatoputapu have distinctive, radiogenic Pb isotope compositions relative to other Tonga-Kermadec lavas, which are inherited from the basaltic crust of the subducting Louisville Seamount Chain on the Pacific Plate. The subducting oceanic plate and overlying upper mantle beneath northern Tonga therefore have very different Pb isotope compositions, allowing the proportion of Pb derived from both of these sources, and from subducting sediment to be estimated. We show that between 42% and 90% of the Pb in northern Tonga lavas is derived from the subducting oceanic crust. 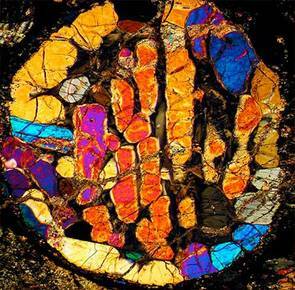 The dominant process of transfer of mantle Pb to the continents is therefore dehydration of subducted oceanic crust. Mass balance calculations show that the Pb flux into the arc crust corresponds to complete Pb removal from the uppermost 160 to 350 m of the subducting oceanic crust, or up to 5% Pb removal from the entire thickness of oceanic crust. The orientation of the Pb isotope arrays constrain the relative timing of Pb addition from these different sources, and show that sediment Pb must be mixed with the upper mantle before Pb from the subducted oceanic crust is added by fluids. Together with existing U-series and 10Be data for Tonga-Kermadec lavas, our results constrain the physical mechanisms responsible for element transfer from mantle to crust in subduction zones. 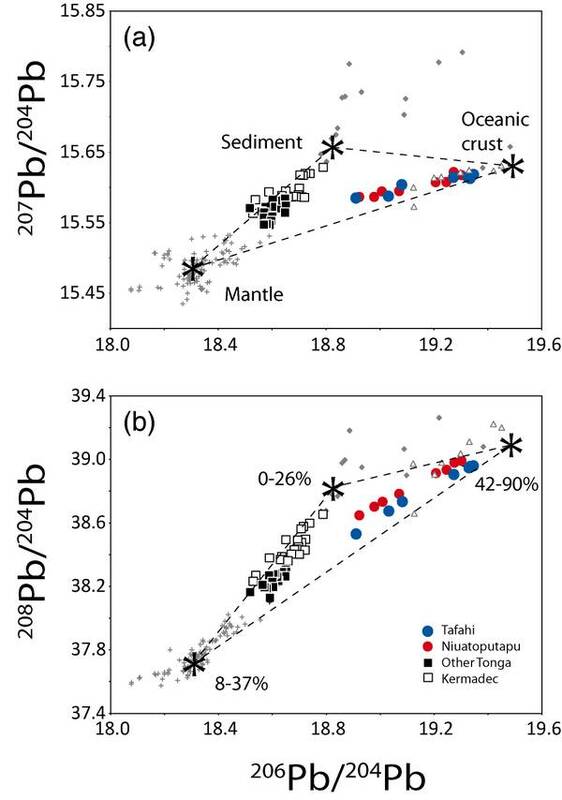 FIGURE: Pb isotope compositions of lavas from Northern Tonga overlap with those of lavas from the Louisville Seamount Chain, which is being subducted beneath northern Tonga. In this region therefore, the upper mantle and the subducting oceanic crust have very different Pb isotope compositions, allowing the proportion of Pb from each source to be calculated from the position of each sample within the ‚mixing triangle‘. Between 42 and 90% of the Pb in these lavas is derived from the subducting oceanic crust, corresponding to complete Pb removal from the upper 160-350 m of the oceanic plate (or up to 5% Pb removal from a 7 km thick oceanic crust). The Hawaiian-Emperor Seamount Chain, in the northern Pacific Ocean, was produced during the passage of the Pacific Plate over the Hawaiian hotspot. 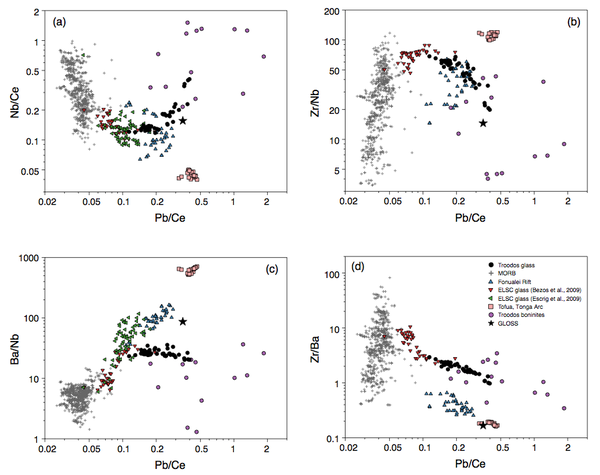 We measured major and trace element concentrations, and Sr, Nd, Pb isotopic compositions of shield and post-shield lavas, from 9 of the Emperor Seamounts. 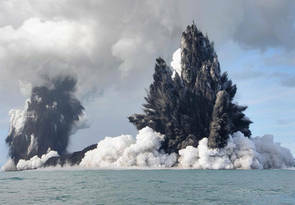 The samples provide a 43 Ma record of the chemistry of the oldest preserved Hawaiian magmatism, during the Late Mesozoic and Early Cenozoic (from 85 to 42 Ma). We show that there were large variations in the composition of Hawaiian magmatism over this period. Tholeiitic basalts from Meiji Seamount (85 Ma), at the northernmost end of the ESC, have low concentrations of incompatible trace elements, and unradiogenic Sr isotopic compositions, compared to younger lavas from the Hawaiian Seamounts (43-5 Ma) and the Hawaiian Islands (<5 Ma). Lavas from Detroit Seamount (81 Ma) have highly depleted incompatible trace element and Sr, Nd isotopic compositions which are similar to those of Pacific mid-ocean ridge basalts. 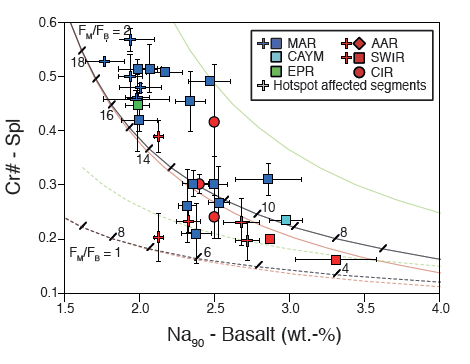 Lavas from the younger Emperor Seamounts (62-42 Ma) have trace element compositions similar to those of lavas from the Hawaiian Islands, but initial 87Sr/86Sr ratios extend to lower values. Between 81 and 42 Ma there was a systematic increase in 87Sr/86Sr of both tholeiitic and alkalic lavas. The oldest Emperor Seamounts were built upon young, thin lithosphere close to a former spreading center, and the age of the oceanic lithosphere, at the time of seamount formation, increases southwards along the Emperor Seamount Chain. 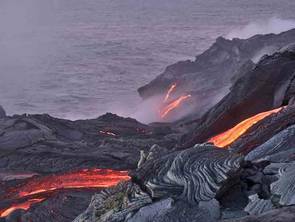 The inferred distance of the Hawaiian plume from a former spreading center, and the isotopic compositions of the oldest Emperor lavas appear to rule out plume-ridge interaction as an explanation for their depleted compositions. We suggest that the observed temporal chemical and isotopic variations may instead be due to variations in the degree of melting of a heterogenous mantle, resulting from differences in the thickness of the oceanic lithosphere upon which the Emperor Seamounts were constructed. 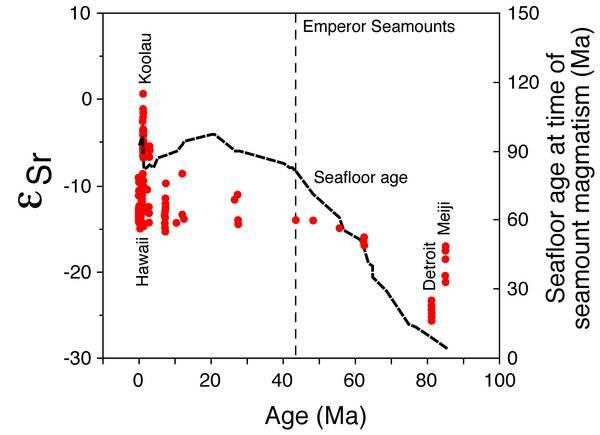 Sr isotope compositions of Hawaiian shield-building lavas (red symbols) were less radiogenic at 80 Ma, when the oldest Emperor Seamounts (Detroit, Meiji) were constructed. These seamounts were built on young, thin oceanic crust close to a former spreading centre, and their depleted compositions are best explained by relatively large degrees of melting of a heterogeneous mantle, consisting of enriched, easily-melting lithologies with high Rb/Sr, high 87Sr/86Sr, in a more depleted, refractory matrix. 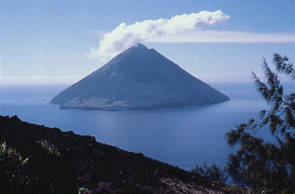 The thickness of the oceanic lithosphere controls the length of the melting column, and thus the compositions of lavas erupted in intraplate locations. We have developed new methods for chemical separation and isotope analysis of nickel, and carried out high-precision nickel isotope measurements of bulk iron and chondritic meteorites. These preserve small (< 30 ppm) but significant variations in the 58Ni/61Ni-normalised 60Ni/61Ni and 62Ni/61Ni ratios (expressed as ε60Ni and ε62Ni). Ordinary and carbonaceous chondrites have ε62Ni values <1 and >1 respectively, and irons display a similar range. Only enstatite chondrites have identical Ni isotope compositions to Earth. Within chondritic meteorite types, variations in ε62Ni are positively correlated with variations in ε54Cr, indicating incomplete mixing of a high ε62Ni, high ε54Cr, and a low ε62Ni, low ε54Cr component, which are likely contained in silicate and metal phases respectively. Variations in ε62Ni are of nucleosynthetic origin and provide a means to link chondritic and differentiated meteorite types. 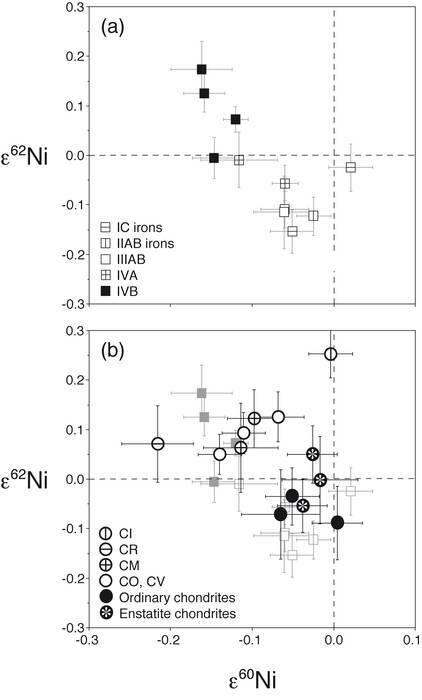 The similar Ni isotope compositions of Group IVB irons and CO, CV carbonaceous chondrites suggests that they were derived from planetesimals that accreted from material of similar isotopic composition. Similarly, the overlap in Ni isotope composition between the abundant IIAB/IIIAB irons and ordinary chondrites suggests that these were also derived from precursor material of similar composition. Although variations in 60Ni/61Ni can result from decay of extinct 60Fe (half-life 1.5 Ma), much of the observed variation in ε60Ni in our samples is likely of nucleosynthetic origin, particularly in chondrites which display a restricted range in Fe/Ni. At least some of this variability reflects variable ‘fossil’ 60Fe associated with the high 62Ni, high 54Cr silicate phase. If the parent bodies of IVB and CO, CV carbonaceous chondrites, and also II/IIIAB and ordinary chondrites were built from precursor material of similar isotopic composition, then the observed overlap in ε60Ni can be used to place upper limits on the 60Fe/56Fe of this material. Initial 60Fe/56Fe ratios as high as 3 x 10-7 may characterise ordinary chondrites, consistent with in-situ measurements of sulphides. However carbonaceous chondrites must have had 60Fe/56Fe <1 x 10-7, which implies that 60Fe may not have been homogenously distributed in the protosolar nebula. Nickel isotope compositions of (a) iron and (b) chondritic meteorites. Variations in e62Ni are of nucleosynthetic origin, and provide a tracer of the precursor material that accreted to form iron and chondrite parent bodies. 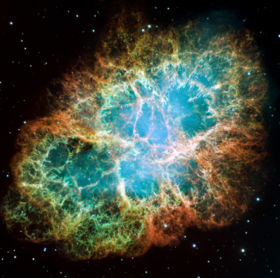 Only enstatite chondrites have identical Ni isotope compositions to Earth, suggesting that the bulk Earth may have a chemical and isotopic composition similar to that of enstatite chondrites. The overlap in e62Ni between irons and chondrite types indicates that the Solar System initial 60Fe/56Fe was < 3 x 10-7. The role of flood basalt magmatism in causing mass extinction events is hotly debated. There is uncertainty regarding the relative timing of flood basalt magmatism and extinction (and hence any causal relationship), because the former were emplaced on land, whereas the record of changes in climate and biodiversity is preserved in marine sediments. Sediments and basaltic lavas must therefore be dated independently, often using different methods, which limits the temporal resolution possible. 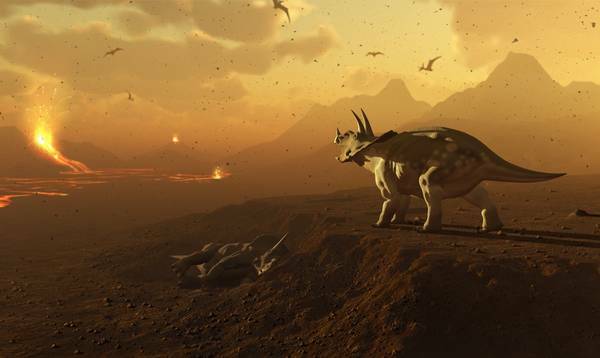 An alternative approach, which has not been attempted previously, is to correlate the volcanic and biostratigraphic records across major extinction events using chemical analysis of volcanic ash (tephra) preserved in marine sediments. 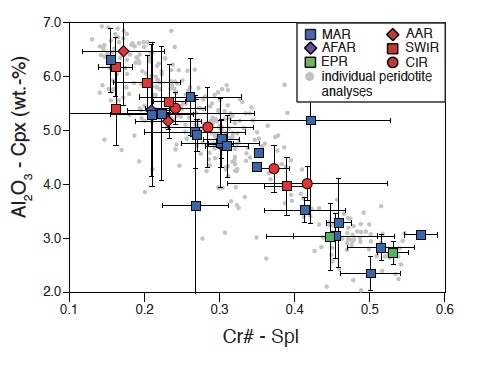 The major and trace element compositions of individual glass shards from tephra layers in sediments of selected age will be determined using microanalytical techniques (electron probe and laser-ablation ICP-MS), in order to fingerprint their provenance. We will be able to distinguish between tephra derived from flood basalt eruptions and from other possible sources (intraplate or convergent margin volcanoes) on the basis of major and trace element chemistry. If fresh volcanic glass shards are preserved in DSDP-ODP cores, it may be possible to link directly the volcanic and biostratigraphic records, which would give new insights into the relative timing of magmatism, extinction, and impact events (the latter from Ir anomalies in the same sediments). More generally, I am interested in the links between tectonics, volcanism (inluding weathering of volcanic rocks) and climate on long time-scales. For example, we have recently intiated a project to examine the chemical and isotopic composition of island-arc lavas preserved along the margins of the former Tethys Ocean. Subduction and decarbonation of large volumes of deep-water marine carbonate has been proposed as a mechanism for maintaining high atmospheric pCO2 and warm climate in the late Mesozoic and early Cenozoic. The well-documented relationship between the trace element composition of subduction zone lavas and the flux of elements in sediments subducted at the adjacent trench can be inverted, allowing past subducted sediment compositions to be estimated from analysis of arc lavas preserved at Tethyan margins. The results will allow us to test the hypothesis that large volumes of carbonate-derived CO2 were released from the subduction zones bordering the former Tethys.